Nothing ruins a beautiful view like patches of mold all over the window. If mold and mildew are plaguing your windows, getting rid of it will take some effort, but you can do it without specialized cleaning products. Once your windows are sparkling again, correcting the conditions that allowed the mold to form will ensure it won’t come back. 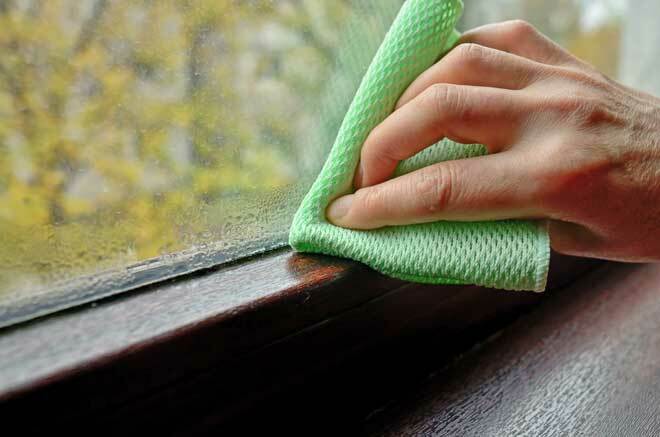 To remove mold from window glass, all you’ll need are some basic household cleaners. Because glass isn’t particularly porous, the roots of mold don’t penetrate it deeply, making the mold easy to scrub off. Fill a gallon bucket with hot water and add 1 cup bleach or 1 cup hydrogen peroxide. If you don’t have either, you can use 1/2 cup powdered dishwashing detergent and 1/2 cup borax. Open the windows in the room to provide good ventilation while you work. If you’re sensitive to molds or you have allergies or asthma, it’s helpful to wear a dust mask and gloves even for small mold cleaning jobs. Apply the solution to the glass using a spray bottle, sponge, or cloth. Gently scrub the glass to remove the mold. Rinse the window only if you think your kids or pets might come in contact with the glass and get the cleaning solution into their mouths. Leaving a little solution on the window inhibits future mold growth. Chances are if there’s mold on the glass, there’s also mold on the window frame, especially if it’s wood. Even if you haven’t seen any mold there, you should inspect the frame closely. Any mold left lingering will spread back to the glass and, even worse, the rest of the house. Bleach won’t work well here because it can’t penetrate wood well enough to reach the mold’s roots. 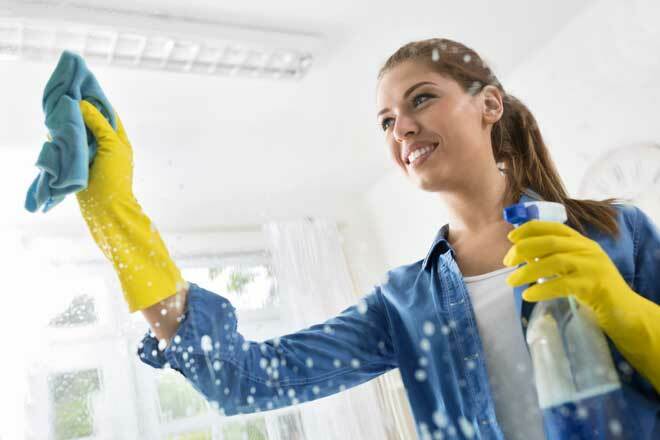 A better option is the same solution of 1/2 cup powdered dishwashing detergent and 1/2 cup borax in 1 gallon of water that works well on glass. Distilled vinegar is another effective solution. Either spray it onto the wood or pour some into a bucket and apply it to the wood with a spray bottle or sponge. Then use a soft scrub brush to scrub the moldy areas gently but firmly. For unfinished, unpainted wood, you can use denatured alcohol in the same way. Alternatively, pour 3 percent hydrogen peroxide into a spray bottle, spray it onto the moldy wood, and let it sit for 10 minutes. Then scrub the area with a soft brush. Commercial mold removal products (fungicides) are also an option. If you decide to use one, make sure to follow the product’s instructions exactly. Exposure to large amounts of mold can cause nose and throat irritation, coughing, skin rashes, and eye irritation. If any part of the window is covered with thick mold growth, wear rubber gloves and a dust mask or respirator to minimize your contact with the mold. Start cleaning by using a vacuum equipped with a HEPA filter to remove as much of the mold as you can. This cuts down on the spores floating around. Once most of the loose mold is gone, use your homemade or commercial cleaner of choice to remove the remaining mold. A mold problem that’s spread throughout the house is best left to a mold remediation specialist. These professionals have the knowledge and equipment necessary to remove the mold safely and permanently. When mold takes root in your home, it’s because your indoor air quality and humidity levels provided the conditions it needed to grow. Excess indoor humidity is the biggest contributing factor in indoor mold problems. 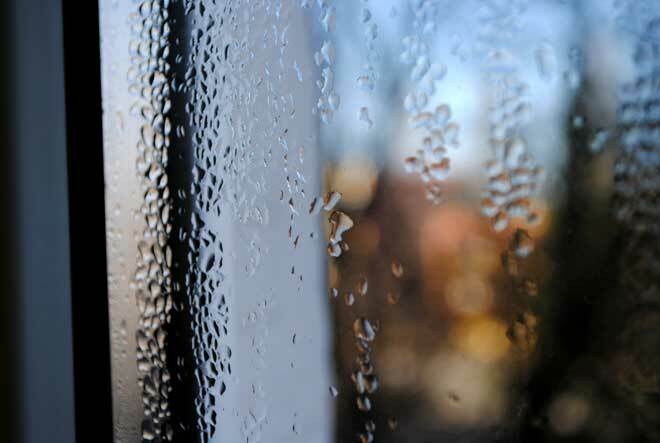 High humidity shows up as frequent condensation on the windows, water stains on the walls, and a chilly, clammy feeling during cold weather, even with the heat turned up. For a more accurate assessment of your humidity, hang a hygrometer on your wall. Ideally, it should give you a relative indoor humidity reading of between 40 to 55 percent. Anything higher than this will contribute to the growth of mold, dust mites, and bacteria. To get your humidity under control, start with basic steps such as running your vent fans for 10 to 15 minutes after you’re done cooking and showering, keeping lids on your pots while cooking, repairing leaky faucets and pipes, and restricting most of your house plants to one room. Taking shorter, cooler showers helps, too. If you’ve done everything you can think of to bring your indoor humidity into a healthy range, but you still have damp air, the problem is most likely poor ventilation. In this case, running the air conditioner on the “fan only” setting for an hour or so a day will often help remove excess moisture from the air and filter out mold spores. For a more effective solution, consider having a whole-house ventilation system installed. These systems either vent out stale indoor air, bring in fresh, filtered outdoor air or both. Keeping mold spores out of your home also reduces the risk you’ll end up with mold on your windows or elsewhere. Mold spore counts are highest in fall and spores are released at night and very early in the morning. Before and after rain storms are also peak times for mold spores. As much as possible, keep your windows closed at these times. Mold spores and other air contaminants can also come in through tiny cracks around your windows, doors, baseboards, vent fans, pipe and wiring entry points, and many other places. Use caulk and weatherstripping as appropriate to seal these cracks. A little mold around your windows is easy to get rid of with household cleaners such as bleach or vinegar. Mold spreads quickly, though, so before you start cleaning, inspect the area around the window for mold growth. If you find your mold problem is widespread, contact a mold remediation specialist to avoid risking your health. Once the mold is gone, the only way to keep it from returning is to correct the humidity and air quality conditions that allowed it to take hold in the first place. Do this, and you can enjoy a healthy, mold-free home for as long as you live there.